How Does One Import Midi Keyboard Sounds to an iPad? Good question! How DOES one import midi keyboard sounds to an iPad? I searched and could not find this question or its answer. Thanks! you connect the audio out of the keyboard to an audio interface which plugs into a usb adaptor which plugs into the lightning port of the ipad. You can then either play the keyboard and record the output or sample the sounds into a suitable sampling app. The latter option is what you need if you want play the sounds within the ipad. or are you talking about midi information, which is control information independent of the sound? Thanks @PhilW. The former, getting the actual sounds into the iPad. Would a Korg PlugKey do it? If not, what? I am limited here in Turkey. Also, what app would you recommend. Could the patch go directly into Cubasis? So you want to record audio into the iPad from your keyboard? Is that what you mean? Any class compliant audio interface will work with the USB connection dongle, but some won’t work without a powered USB hub. The plugkey won’t work it’s just MIDI In and audio out I believe. Perfect for a live keyboard player, but not recording. There aren’t many keyboards that you can use to send a patch made on it to iOS apps. Maybe M1 or DX7 I think there might be a few ways to translate them into iOS patches, but most keyboards don’t have interchangeable patches. You can also do multisamples of your keyboard if you want those sounds available and depending on the sound it could work. It won’t be that patch, it’s more like a playback of that patch as it was played when sampled. You basically record every few notes chromatically or even all the notes if you want, find loop points, etc. Apps I’d use for this approach would be BeatMaker 3 or one I haven’t used is VirSyn’s AudioLayer. I’ve used SunVox in the past too and it’s also a good option for doing this. Cubasis does have a multisampler built in, but I’ve never tried it. Thanks @dman. Strange that it is not a simple thing to do. I will be trying to do it with a Kawaii MP 7 or 11 which has USB and midi in, out and thru. I get that the PlugKey won't work. I can record it as a wav file on the hardware. Might that help? There are a few keyboards that have an audio interface built in, which means that a simple usb connection between the keyboard and the ipad is all that you would need. But for most you need to have an audio interface. I use a cheap Behringer UCA202 with no problems, although I have also been eyeing the Zoom U-24. If your keyboard can record to wav you could do that and then transfer the file somehow to a DAW on the ipad such as Cubasis or Auria. You wouldn’t need the interface that way, but if you are matching timing between different parts, you’d need to do that manually, so I think an audio interface would be more convenient in the long run. It might even work as a soundsource (if the MP7 is connected via a CCK to an iPad), but Kawai's language is extremely diffuse about this topic - at least I couldn't figure it out from the specs sheet. Which also applies to the audio recording/playback unit - they just don't name things in an unambigous way. I normally hate videos, but in this case I'd really lookup one to verify features. If the MP-7 saves an audio file, you'd still have to get that into the iPad. There are various ways with networked pendrive/storage devices or a Mac/PC - but not with the keyboard and iPad alone. @LinearLineman you still haven’t been clear about what you want to do. Do you want to record a performance as an audio file to play back / use in the iPad? Do you want to use the keyboard to play iOS synths (where they make the sound, not the keyboard)? Do you want to capture the sound patches out in such a way that you can play them back as notes without the keyboard in some app? The answer is actually simple once the question is clear. Without that you’re going to get a lot of confusing answers. So then, it looks as though @Telefunky has provided the best answer so far. It sounds as if you don’t need a special interface other than the Apple Lightning USB adapter. How to configure the MP7 is unfortunately not something I can help you with. If it was me I’d start by plugging it in and checking to see if it shows up as an audio or midi device in anything. If not then I’d start menu diving to see how to turn on USB audio and./ or midi output. As a last ditch resort I’d try RTFM. 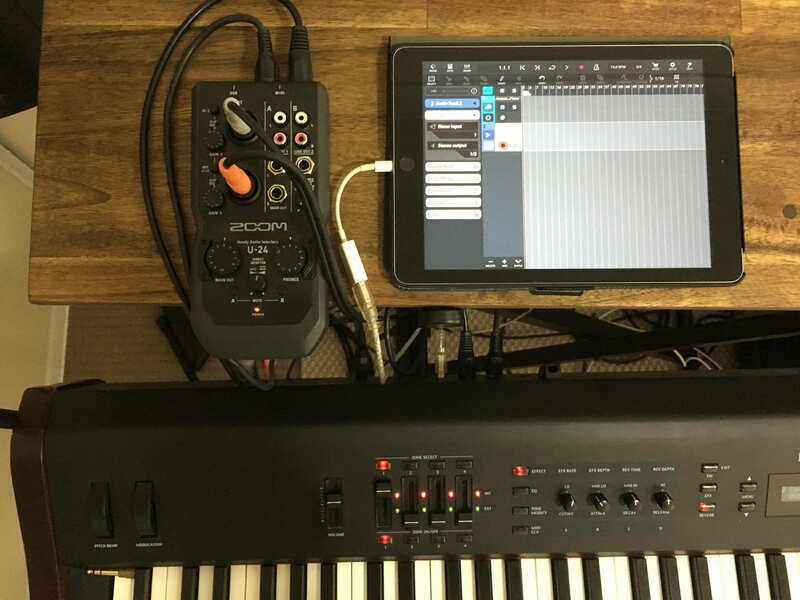 The only way you'll be able to record the piano sounds in the MP7 is with an audio interface connected to the iPad. That interface could be connected using the Apple Camera Adapter or it might have a Apple Lightning terminated cable. The Kory MidiPlug gets audio out of the iPad but doesn't have the audio input feature. Finding a music store that can sell you everything but the iPad would be a good idea. Importing the piano samples out of a Kawai (or any other major sample-based stage piano) is NOT in the cards. They are the keys to that vendors mojo and they compete on the quality of that sample set (and the touch of the keyboard). See if you can get access to the IK Multimedia iRig Pro Duo (to record stereo channels) on the iPad using their Lightning cable. iConnectivity's iConnectAUDIO4+ is highly respected on the forum. I have good luck with the PreSonus USB Audio interface. If all this seems like a bridge too far... remember you can just stick with MIDI and use the RC275 piano app and all the other great apps and keep making great music without adding an audio interface. Just use the Korg MidiPlug for that or the Apple Camera Kit and USB MIDI from your controller (if it supports USB MIDI... most do now). In theory, with a suitable fairly basic interface, you could record the MIDI (data representing the notes played) of a performance played on the Kawai at the same time as recording the Kawai’s output as an audio track. If that’s all you want, it’s not hard. if you want to record audio and MIDI at the same time. There are many different ones available, the thing to look for is that it has both audio inputs/outputs and MIDI inputs/outputs, and that it is 'class compliant'.......and also make sure your piano has MIDI out ports and not just USB. and a USB powered hub, you can then connect both the audio interface and your keyboard to the USB HUB, and then the HUB to your iPad. Whichever option you take you will also need a CCK (Camera connection kit), only use an official one of these from apple, many 'clone' ones just don't work anymore. You mentioned that you can record as wav on the keyboard....if you can do that then you may be able to get that wav from your keyboard and send it to your iPad via iTunes/Dropbox, I would bet that you cannot do this without a desktop PC of some sort though. Thanks @wim, @McDtracy , @TheOriginalPaulB , @AndyPlankton, you have all given me a lot of info and options. How did it work out for you? What option did you end up using with your MP11? Would be interested in your experience. You don't want the Kawai piano sounds to be playable as instruments in Cubasis, do you? Sorry @StMichaels, still struggling to get the keyboard. This is Turkey. Sometimes things are really Byzantine! @rs2000, yes, that would be my aim, if possible. Do you need to capture the different sounds at different keyboard hit velocities or would you be OK with one sample per key? In the latter case the most straightforward solution would be sampling into Minisampler. 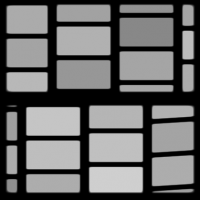 You could sample every white key, for example, and map it to the according key range in Minisampler. That won't be near as expressive as your Kawai however, because the sound won't change (except the level) no matter how hard you hit the key. Thanks, @rs2000, a limited sample would sort of defeat the point. I find it so strange that this is a difficult task to accomplish. Could someone possibly make an app that would do it? The app exists and is called Beatmaker 3 (and BM2 can do it as well). Sampling all those keys at 3..5 velocity levels is a bit of work however. If you really want to go this route, pm me for how to make the process a bit more automated. A fully automatic process would require an app like SampleRobot or Redmatica AutoSampler on iOS. We don't have it today. Wow, @rs2000, I will investigate Mainstage, but I am basically technophobes. Not sure I could muster the forces required to accomplish the feat or if it is worth it. Thanks! @LinearLineman : what you want to do , I think, is record a MIDi track in Cubasis whose destination is your external keyboard AND have an audio track to capture the audio for mixdown. It is straightforward. Think of your external keyboard as if it were an actual, not virtual, instrument. Thanks no of it as recording your keyboard rather than importing something from it. again? Or is it two processes. Have a midi track recorded, then route it to the keyboard and midi back in somehow using the onboard sounds? Do I sound thoroughly confused! You record the midi in Cubasis and the audio from the keyboard on an audio track. You don't need to capture the audio till you are ready to mix. You don't need to thru the live midi back to the kbd. Think of your midi keyboard as a player piano. Recording the midi is like creating the paper scroll. I will try that soon @espiegel123 . Thanks! Well, it is a month later and I finally got the MP11... Or rather the 11se. By some miracle I got the only one in Tutkey and instead of overpaying for an older used model I actually underpaid for a new current one. The mysteries of the orient! So, now, I have the new Shigeru sample on the se and, frankly, it sounds a lot better than any iOS piano, even my beloved Ravenscroft275 ( @McDtracy, I am fessing up as you insisted). I have investigated the Steinberg's UR22 mk2 and it has what I seem to need, midi ins and outs, audio ins and USB. Now there seems to be a sure fire possibility as suggested above: record midi into Cubasis. Then, in a separate operation, route the midi track back to the 11se, use the audio outs and use the 11se as a sound module and record the audio back into the iPad. However, I am still going to have to 1/ figure out all the cables I need and, 3/ make the right connections 3/ wonder if there will be a latency issue. USB and lightning ( charging port, but which can be used as a midi or audio input at the same time as the USB as @Kuhl has sort of suggested. 1/ plug midi out from keyboard to midi in and the USB to iPad. (Midi cable and USB cable) The easy part! 2/What connection do I make to get the midi track out of the iPad and back to the interface? And what cables do I need? Obviously midi in to the keyboard from the interface, but what out from the iPad into the interface? lightning from cck? USB from cck? Do they work both ways, in and out? Into the keyboard via midi from the iPad ( again how?) in to the interface and simultaneously audio out to the Steinberg's audio ins and then the USB out to what? CCk's lightning or USB input? Do I yet need another piece of hardware? And will there be a latency issue? I hope I can accomplish that with some cabling feedback from you gentlemen ( ladies welcome, of course, but cables are usually a man thing... You know, The Cable Guy). I hope I have not revealed my total lack of understanding, but I probably have, so please, be gentle with me! Now, can I do both operations simultaneously? My mind reels ( to reels). 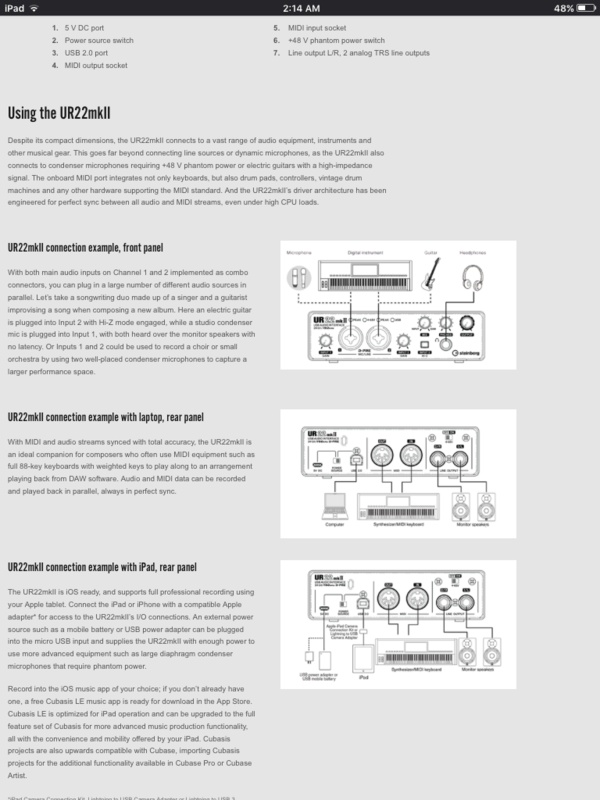 Make all the connections shown in the UR22mkII document. When you press a key the selected internal sound will be generated and sent out the audio R+L channels. The Kawaii should also send tje MIDI note event over the MIDI cables (and maybe the USB cable as well). On some keyboards that support Audio over USB the R+L audio will be sent over that cable too. Does a Kawaii 11SE support Audio over USB out? So, with these connections Cusbasis should be able to record the Kawaii's sounds and the MIDI events on 2 tracks. Now you'll want to monitor the sounds so you want other track in Cubasis to get out of the iPad to the UR22mkII as well. Put head phones in the UR22mkII or connect the UR22mkII to your powered speakers. This should complete all the cabling to play, record, monitor and even send MIDI back into the Kawaii to have it play recorded MIDI sessions or use MIDI tools on the iPad to drive the Kawaii as an external synth. Let's start knocking off verifying the connections one at a time and get the application settings right. First, get all the cables needed using the UR22mkII document for a shopping list at a music store or online. Forget about USB Audio in or out of the Kawaii. It doesn't support it and the USB connection from the UR22mkII will go to the iPad anyway... sorry to confuse the issue. But the UR22mkII will take audio in fro the Kawaii and forward that audio over the USB link tothe iPad for recording. The iPad will send out audio over USB and the UR22mkII will output those sounds to the headphone port and to it's audio outs for your powered speakers to play. Here are the basic connections required. And the speaker connections too assuming audio (L+R) is for the Kawaii line outs. If Audio (R+L) is for speakers then audio cables from the Kawaii need to be added.